I have a tiny dilemma in my kitchen and it comes in the form of an eggplant. I happen to really like eggplant, though my husband does not. And to be honest, I can't remember more than two times I've actually used one to put together an eggplant parmesean. And while it was quite delicious, I'd like to explore other options. After browsing trusted recipe sites, blogs and the like, I can't seem to find much more than the said lasagna, ratatoullie and grilled eggplant sandwiches, which I know Chris would not appreciate. 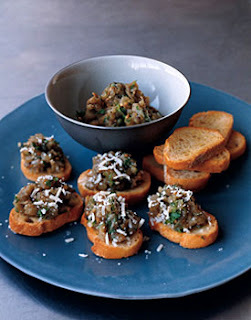 That is until I found this Eggplant Bruschette recipe which sounds pretty amazing! Hmm, I'm still not sure, though I need to make a decision quickly before my eggplant goes bad! Any suggestions from you brilliant cooking minds? I would really appreciate you throwing any great recipe ideas my way. I use it in a variation of a vegetable medley that my sister Marci and I would make. Cut everything up into small strips/pieces. Throw everything except for the eggplant into a baking dish with a little olive or grape-seed oil. It's best to cook the eggplant separately so that it does not get slimy from the tomato juice. Cook at 400f for about 15-20 min depending on how small the pieces are. 5 min before taking it out sprinkle it with Parmesan or Romano cheese. And voila! I love it as it's own meal but it is also great as a side dish with chicken. Oh, thanks Becky! Sounds delicious! !